Marc M. Boutin, JD, is chief executive officer of the National Health Council (NHC), which advocates for the 133 million Americans living with chronic disease or disability. He is a leading voice for greater patient involvement at every stage of the healthcare continuum. The NHC and its members create and implement pragmatic strategies and public policy that address diverse issues, such as enhancing patient engagement, advancing the development of new treatments, and developing a better health delivery system to meet the needs of people with chronic conditions. The National Health Council is a National Quality Forum (NQF) member, and Marc is involved with the NQF Measure Incubator™ Partnership and Collaboration workgroup. NQF spoke with Marc recently about the patient perspective in improving healthcare quality, and the NHC’s work. NQF: The patient perspective is vital to improving quality, and capturing the patient voice is increasingly important in quality measurement. How can we better reflect both in healthcare? MB: What is meaningful to patients is often not reflected in quality measures. It is imperative that quality measures and programs capture the aspects of care that matter most to patients. One way to achieve this is to ensure that the goals of patients are understood in the context of their individual circumstances and that care is designed to consider and achieve those goals. For patients to meaningfully participate in quality measure or program development and use, patient-specific education is vital. That is why the NHC, in collaboration with NQF and the University of Maryland, is creating a patient-specific curriculum on healthcare quality to help patient advocacy organizations and people with chronic diseases and disabilities understand their essential role in health quality discussions. The project is funded through a Patient-Centered Outcomes Research Institute (PCORI) Eugene Washington PCORI Engagement Award. The funding helps develop a skilled community of patients to involve them in every aspect of PCORI’s work. NQF: Can you tell us more about the importance of your work for people living with chronic diseases and disabilities? How does the National Health Council, with its multifaceted membership, help address their concerns in the public and private sectors? MB: One of the key values of the NHC is that we work with our members on behalf of the patient. Our diverse membership may not always agree on a given strategy, but we all believe that aligning care for the needs of the patient is the purpose of healthcare delivery. We recognize that compromise means everyone sacrifices something to come together for a solution that works for the patient. The NHC advocates for a public policy agenda that includes meaningful access—which we broaden to include delivery system design, payment models, and quality measures—and innovation. The NHC identifies and tackles these complex health issues by convening and collaborating with diverse stakeholders across healthcare. This process ensures that all stakeholders’ views are captured and incorporated through the lens of what is important to patients. 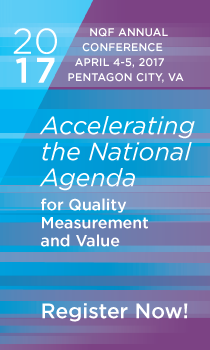 NQF: How is NQF membership helping to advance the National Health Council’s work? MB: Our NQF membership helps the NHC further its work in getting us to a patient-centered health ecosystem. As we continue to partner with NQF and work more closely, we will see quality measures emerge that best reflect patients’ needs and wants.